Last Sunday, January 20th, we went to the Shrine of Schöensttat. 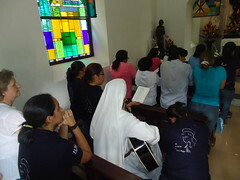 Some members of the Home, along with others who wanted to make their first commitment, came together in the Parish of Loreto (Guayaquil) for a talk about the spirituality of the Home. 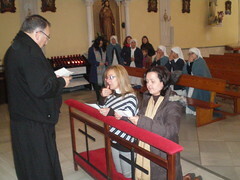 On January 13th, the branch of the Lay members of the Home of the Mother (LHM) began in Macael (Almería, Spain). 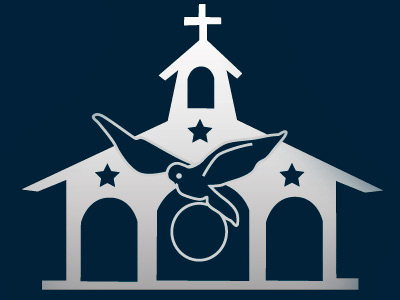 On the occasion of the Year of Faith proclaimed by Benedict XVI, the EUK Mamie Foundation, an initiative of the Home of the Mother, has taken advantage of the opportunity to launch a new program entitled, “Rediscover”. The program consists of 2 DVD’s that cover various aspects of the Faith: 'Faith and Reason', 'Faith and the Church Today', 'What Does it Mean to Believe? ', and 'Faith and Love'. Last Sunday, January 13th, the Servant Brothers of the parish of Our Lady of Loreto, Guayaquil, went on an excursion to “The 7 waterfalls” with a goup of 30 young men from the parish. The E.U.K. Mamie Foundation has launched its new web page. Now, with its new design, it offers you much more. This year the three Kings visited several different zones of Guayaquil (Ecuador).